It's pretty obvious by the above photo that we're not far from reaching the end time many pastor's and prophet preached about and i won't be wrong if i say we live in a fucked-up generation where every lady wants to be or professionally dress like the Kardashian clan. 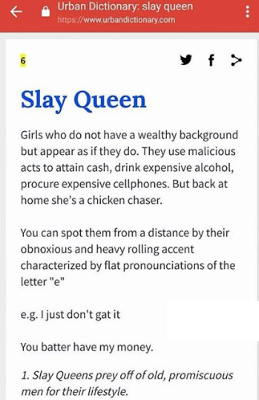 Well before you start throwing tantrums at me, i want you all to have a look at what Urban Dictionary has to say about a slay queen. Now that you know what a slay queen is, what's your thoughts on this?